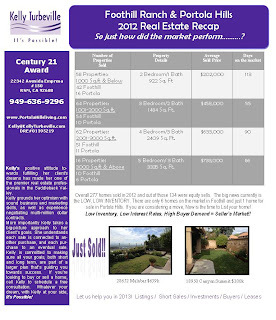 Wowza, 2012 turned out to be a pretty busy year for the the communities of Foothill Ranch and Portola Hills in Lake Forest. Nice to see properties began to move and better yet, prices started to increase towards the end of the year. The year ended with extremely light inventory of homes for sale, Portola Hills had just 1 listing available and Foothill Ranch had 6 active listings. If you are thinking of a move, now is the time to contact your Realtor, the rules of supply and demand are true, low inventory, high demand + low interest rates pretty much guarantee your home will sell at an increased price. Please, please do not under value your home. We are seeing new listings come on the market valued way below market. Pricing your home at the correct market value will bring you the right results! Take a look at how the market did and if you would like a specific review of your neighborhood, give us a call!